Merry Christmas!! I hope y'all had an amazing Christmas Eve and Christmas Day with your families and loved ones. I had a fabulous time and lots of delicious food. My grandma made turkey and Trifle and I can't even explain how lovely it was!! I must have gained 5 kilos over these days but it was totally worth it. I'm really excited and looking forward to it!!! Starting a blog wasn't an easy decision for me. Not because I wasn't sure wether I would want to do it, no I was and still am a bit afraid that people will hate on me for my opinion. But after a few weeks of thinking about starting a blog, I decided I should at least give it a try. This blog is about me and my opinions and if someone disagrees it's totally okay. I don't want to force anyone to read my blog, if you don't enjoy reading what I write just leave it, rather than writing unfriendly comments. But if you enjoy it, the better! I'm happy about everyone that visits my blog because sometimes it can be quite frustrating, because you take time to think about a good idea for a post, write it, maybe even take pictures and edit them and I in the end you have the feeling nobody will ever read this. But I guess that's normal at the beginning. The main part for me anyway isn't to have hundreds of people, who read my blog but a few that genuinely enjoy reading what I write. I started my blog about a year ago and I must say, I myself can recognize a progress. It might be tiny but still it's here and up to know, it's been a great project to work on. Posting regularly isn't my strong point I know, but I rather upload less, than to upload boring and uncreative stuff all the time just to say I upload regularly. I may not upload every week but when I upload, I really try to create something original and interesting for you. Although in the last few week I've been really lazy and had had no ideas at all on what to write. For the future I can say; I've got a few ideas and I hope you'll enjoy them. One thing I learnt through starting a blog, is that if you really want something, just do it and don't think about bad things that cloud happen because if you do, you might miss a lot of fun and exciting stuff. I really don't regret starting a blog and honestly I'm also a little bit proud of myself because I created my own litte space on the interwebs, where I can totally be myself and say what I think. Hello, hope you're all doing well!! In my last post Sunshine where are you? I told that I was feeling really tired and exhausted lately. After uploading this post I tried to stick to these things I wrote about and I must say I recognized a difference. It's not the same as if you would take medicine or such things but it's a really good way to avoid tiredness without having to do much. If your feeling a little worn out at the moment you might wanna go and read my recent post. But now on to the actual post. I've already done one post about my monthly favourites once and for March I decided to do another one. Now the question is if you would like me to do such a post once a month or just for every season?? Or not at all? I would appreciate, if you would leave me a comment or send an email saying me what you would prefer!! I'm always really happy to hear from you, so don't be shy. My first favourite for this month must be the Beautiful Day 24h Moisture Ultra Shea Body Cream by Bath & Body Works. I know it's a mouthful but I can guarantee it's worth remembering because it's next to the Body Shop stuff the best body cream I've ever used. It sinks in really easily and it doesn't give greasy feeling at all and after using it my skin instantly feels much smoother! The scent, I couldn't imagine a better one for something called Beautiful Day. In my opinion it smells like spring, flowers, happiness and freshness (if that's even a word). As you know I really dislike winter and I guess that's also a reason why I love this cream as much as I do. When I'm wearing it I feel fresh and happy and even my PJs and the whole bathroom smells like a spring explosion. After all these good things I said about it you might think I'm lying but everything what I say is the truth for me, if you would like it as much as I do I can't guarantee. But if you're looking for a new body lotion anyway, I would definitely give it a try. My second favourite is a Body Shop product, what a surprise?! It's the Aloe Soothing Gel. I use it every morning after washing my face and on hot summer days when my skin feels dry and tense. The cream is great because it cools and comforts my skin and prevents it from getting really red. I also use it in winter because it's so moisturizing and really light-weight. Often I put it under my foundation to keep my skin hydrated the whole day. But I must say if you've got very dry skin you definitely have use something beside this because it's just not the same like a actual moisturizer, but like I was saying for under your make-up and for in summer to calm your skin and make it look a bit more fresh and awake ( can skin even look awake?!) it's amazing in my opinion. The price is reasonable too, so if you don't like it's not a big waste. 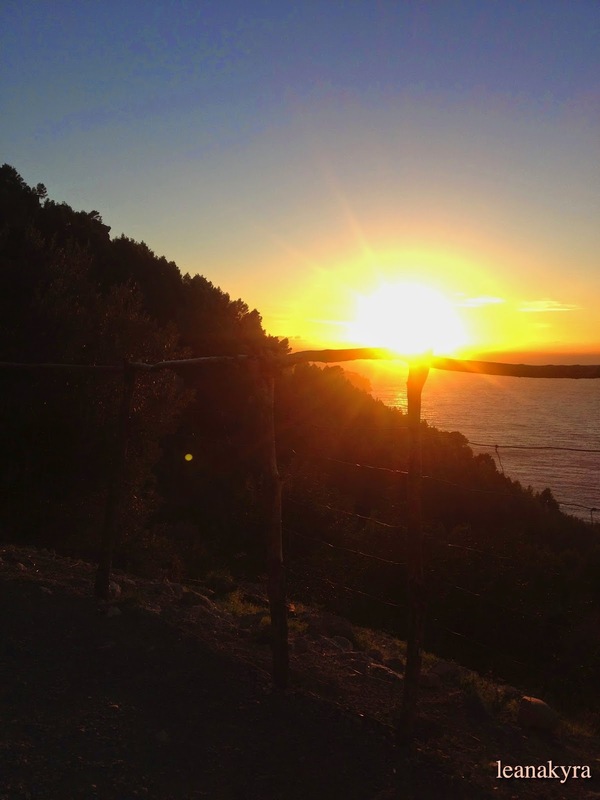 Lately I've been really missing the sunshine because sunshine is very important for us to keep fit and stay healthy. And also your much more motivated when it's nice weather than when it's pouring with rain. So that might be a reason why I've been feeling really tired recently. I guess all of you know the feeling when your exhausted no matter how much sleep you have. The last few weeks I felt like this day after day and honestly it's not fun at all. At first I thought it would just last for a few days, but after a week of being tired all the time, I started searching the internet for helpful tips and tricks to get rid of exhaustion and tiredness. And believe it or not whilst searching the internet I stumbled across some really helpful tips and learnt a few new things about how to avoid exhaustion and what you can do against it. 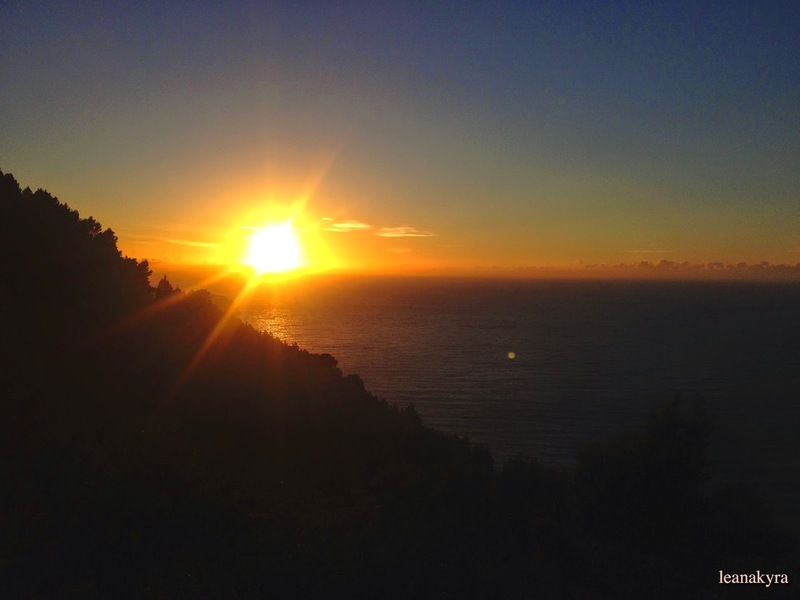 This is a picture I took in Greece last autumn. I wish it was summer again!! And an one more picture of the beautiful sunset. And because it's not a rare thing to feel tired, due to a lack of sunshine I thought I would share my top tips with you. Ohh, and in case you where wondering, where I live it's winter at the moment, freezing cold and no sunshine at all. It's very important to have a good, healthy breakfast every day. Because that gives you energy for the morning. And I also like to always have a granola bar or a fruit with me, so if I get hungry in between I can eat something. Also eating a lot of fruit, vegetables or wholegrain food helps. For example I always drink a smoothies or juice for breakfast. Sleeping regularly is important and if your tired in the morning, it's better to go to bed earlier, than to sleep longer in the morning. A lot of people think, that coffee helps against tiredness but that's actually not true. Coffee gives you a energy boost but that only makes you feel better for a short time and afterwards your even more tired. It's lot more beneficial to drink a lot of water instead of coffee, alcohol, coca or other sugary drinks. If I feel tired and can't concentrate myself anymore, I like to go out and get some fresh air. Doing sport a few times a week is also important for a healthy balance in life. And personally, it helps me to make a list of what I have to get done this day or in the next few days. Like that I can avoid forgetting stuff and coming under stress. This are my personal tips and trick that help me and maybe they will help you too!! If you have some tips or things you do, please leave a comment , so i can try it too. Valentine's day is coming up soon and I thought of what Valentine's day related post I could do. 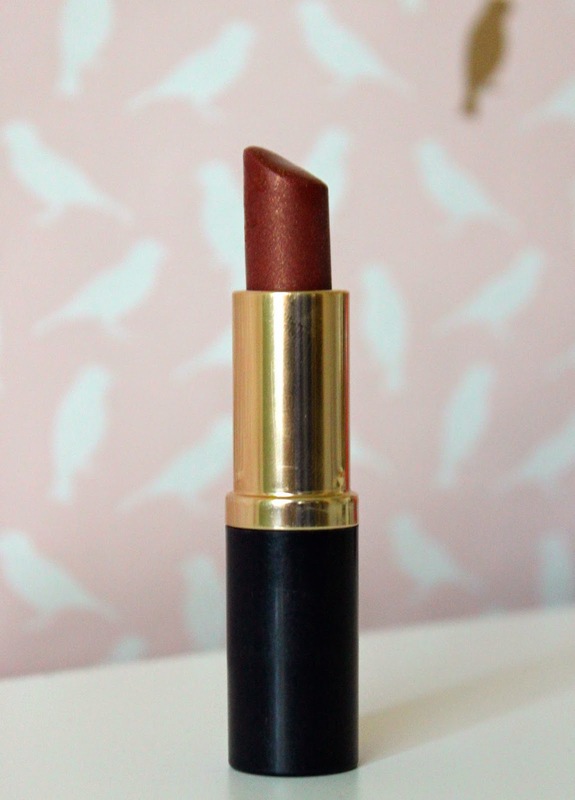 I decided to do a post about one of my favourite lipsticks. Because I think Valentine's day is the perfect opportunity to wear a little bit braver lip colour, for example red. Red lipstick is in my opinion a great choice for this day because it's everything for Valentine's day related pretty much red or pink?! I know there will be a lot of posts and make-up tutorials where bloggers and youtubers will talk about a red lipstick but I still wanted to do this post because it is a great idea to wear red lips on Valentine's day and because the lipstick I will be talking about is one of my favourites in general. And for those who are not as brave or don't like red lipstick I also have a alternative less eye-catching lipstick. 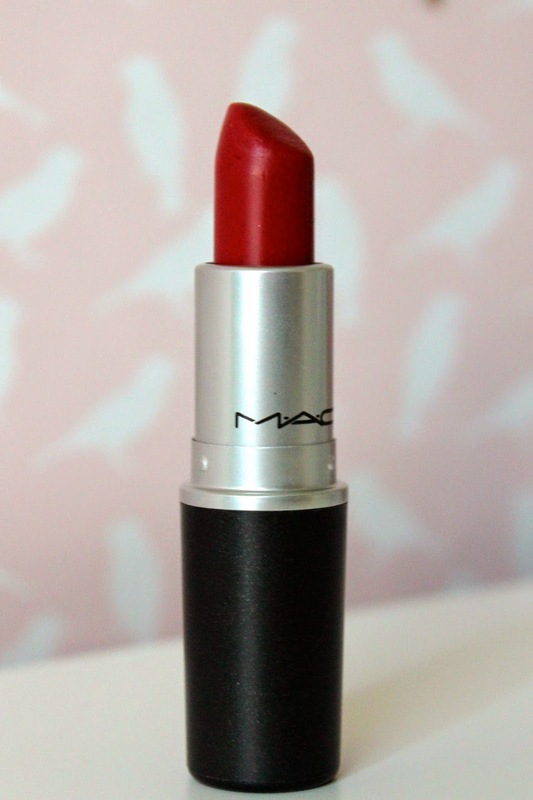 The red lipstick I will wear on Valentine's day is Mäc's Lustre Lady Bug, my favourite red lipstick in general. Although it's red I think it's not as bold as other red lipsticks and it works for any situation. When I'm wearing this lipstick my lips always look nice and glossy but not as if they were sticky. It's really long-lasting even if you would eat or drink something and doesn't dry out my lips at all. My lips feel smooth and moisturised and you don't even realise you're wearing a lipstick it's so lightweight. What I love the most at this lipstick is the scent. That might sound strange but it has a really nice mild and not at all bothering smell. The colour is a nice reddish orange, I know on the pictures it looks more like a classic red but on the lips it's slightly orangey. I think you can wear it to any event and combine it with nearly everything. In my opinion a stable lipstick colour with great quality and totally worth spending a little bit more money on. Wishing you a happy Valentine's day!! I guess everybody knows the feeling when you're so embarrassed you wish you could just disappear or become invisible. To me this feeling is quite familiar because somehow I always manage to get myself into awkward situations. And it's mostly then, when I'm surrounded by people. Sometimes I wish I would be that super confident kid that would make a joke after it had done something embarrassing and everybody would laugh and forget about it. But unfortunately I'm not. I'm more the type of person that if something embarrassing happens to me I try to rescue it but instead of covering it up, I make it even worse. I hope some of you can somehow relate to what I'm trying to explain you. One situation I will tell you about happened in my first week at my new school. Before getting into it, I must say, that for me it's even more embarrassing when I'm new somewhere. Because after that everybody knows you as the clumsy kid and not as the really funny, generous or creative one. That was terrible because they didn't want to get to know me as a person they all already had the feeling they would know me although they only had seen my accident. Okay, on to the situation. It was Thursday. I was at a new school and until then everything had worked really well, I even was a little bit proud that nothing embarrassing had happened to me yet. But this wasn't for long. That Thursday I would eat in the canteen for the first time. I just had paid the lady at the counter and was walking towards the tables. When I tripped, fell and all the food and Sprite spilt over the floor. For maybe two seconds everything was quiet but then everybody stood up and started clapping their hands. I was so embarrassed I was not able to stand up, so I was still lying in my lunch and everybody was laughing. My friend came to me and helped me get up but I could not stay in this room any longer, so I ran out my T-Shirt full of tomato sauce. You can guess what happened next. On my escape through the canteen I bump into the boy I secretly had a crush on and also destroyed his T-Shirt. From that day on everyone knew me. At the beginning I struggled with going back to school and I wanted to change school and everything but I must say I've also learnt things through this accident. Try to do little changes to avoid your clumsiness. In case you would get bullied don't show any reaction because if you do the bullies won't stop. I now that might be hard but I think it's really important not to let people take you down. Don't laugh at other people if they do something awkward because than they won't laugh at you either. And incase the bullying gets worse I would recommend talking to someone about it and maybe even getting help. Also, time can make a big difference because gradually you'll get over it and maybe you will even be able to laugh about it and the others will also forget about it. You can also imagine it like a joke. No joke is funny forever there comes a time where everybody had enough of it and nobody think it's funny anymore. That was the same with my accident, after a while nobody thought it was funny any more and they stopped talking about it. I also have a quote I always tell myself because I think it's really true and it already helped me through some difficult situations. If you have any experience or advice on clumsiness and such things please leave a comment!! P.S; Clumsiness is something natural and you're surly not the only one who's clumsy!! I'm so sorry I didn't blog for such a long time but sometimes in life you have to take a break and concentrate on other things. In my fact it was school. Lately it was really stressful for me and I needed to focus on getting through all the exams as successful as possible. But now as it's all over I've got more spare time I can invest for my blog!! 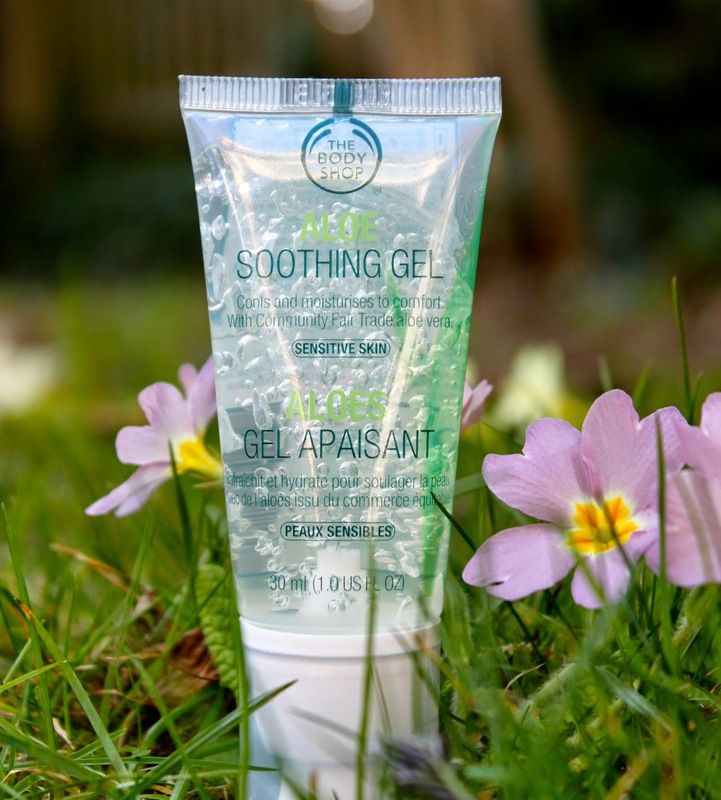 So for this post I will show you two of my favourite skincare products from The Bodyshop. For a really long time I had problems with my skin. Not because it was oily or anything like that, no my skin was as dry as sandpaper. Now I'm using the products of the Bodyshop Vitamin E range. It truly helped my skin and I can recommend it to everybody with dry to very dry and sensitive skin. This is the Cream I use throughout the day. It preserves my skin from getting dry and sinks in really well. The scent is amazing I love it's really fresh and light. When I put it on in the morning my skin is nourished for the rest of the day and in the evening you can use the Night Cream from the Vitamin E range. Which I have to go and buy soon. This facial wash is a mixture between face wash and cleanser. It takes of the make-up perfectly and leaves the skin feeling so smooth. The scent is amazing, in my opinion. I only use it in the evening in the morning I use a different product. My skin is really sensitive and this product is great it not irritates my skin at all. I only have two products from this range so far but I'm really happy with them and I will definitely purchase some more!! Now that I'm writing about them I'm tempted to run to our local store and buy the whole range!!! I know their a lot of different products against dry skin and I've been looking for something for such a long time and have tested so much products and always got disappointed by them. When the lady in the store showed my this range I was afraid to get disappointed once again. But I can really say for me, this is the best thing I've used up to now and I don't regret buying these two products at all. I hope I could give you some advice and if somebody knows a good product for dry skin I would be happy to hear about it! !